New preprint The population history of northeastern Siberia since the Pleistocene, by Sikora et al. bioRxiv (2018). The Yana RHS human remains represent the earliest direct evidence of human presence in northeastern Siberia, a population we refer to as “Ancient North Siberians” (ANS). Both Yana RHS individuals were unrelated males, and belong to mitochondrial haplogroup U, predominant among ancient West Eurasian hunter-gatherers, and to Y chromosome haplogroup P1, ancestral to haplogroups Q and R, which are widespread among present-day Eurasians and Native Americans. Among all ancient individuals, Yana shares the most genetic drift with Mal’ta, and f4 statistics show that Mal’ta shares more alleles with Yana than with EWE (e.g. f4(Mbuti,Mal’ta;Sunghir,Yana) = 0.0019, Z = 3.99). Mal’ta and Yana also exhibit a similar pattern of genetic affinities to both EWE and EEA, consistent with previous studies.The ANE lineage can thus be considered a descendant of the ANS lineage, demonstrating that by 31.6 kya early representatives of this lineage were widespread across northern Eurasia, including far northeastern Siberia. (…) the 9.8 kya Kolyma1 individual, representing a group we term “Ancient Paleosiberians” (AP). Our results indicate that AP are derived from a first major genetic shift observed in the region. Principal component analysis (PCA), outgroup f3-statistics and mtDNA and Y chromosome haplogroups (G1b and Q1a1a, respectively) demonstrate a close affinity between AP and present-day Koryaks, Itelmen and Chukchis, as well as with Native Americans. For both AP and Native Americans, ANS ancestry appears more closely related to Mal’ta than Yana, therefore rejecting a direct contribution of Yana to later AP or Native American groups. 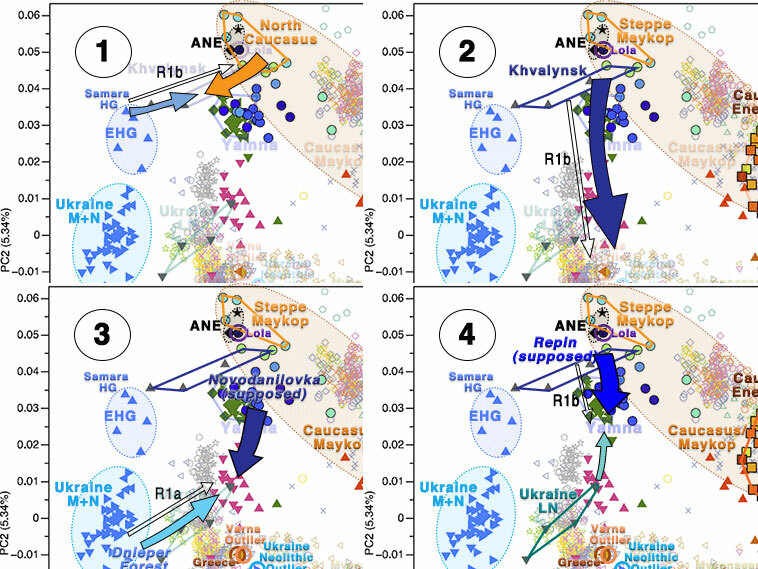 (…) the newly reported genomes from Ust’Belaya and recently published neighbouring Neolithic and Bronze Age sites show a succession of three distinct genetic ancestries over a ~6 ky time span. The earliest individuals show predominantly East Asian ancestry, closely related to the ancient individuals from DGC. 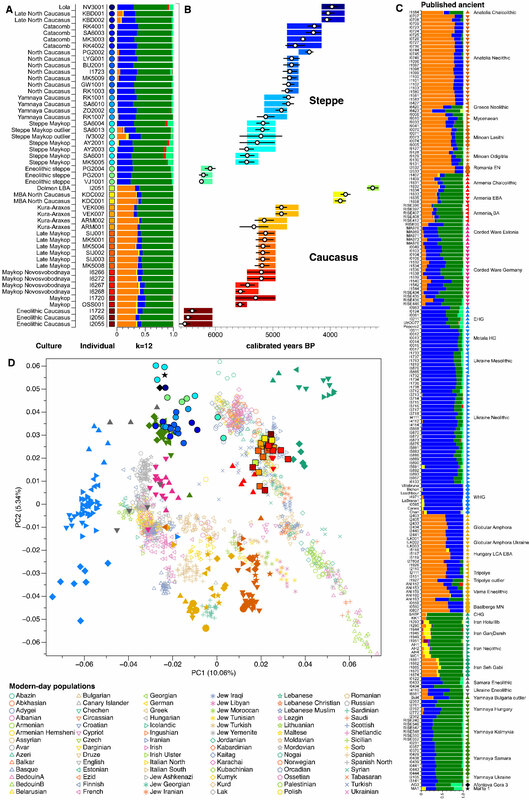 In the early Bronze Age (BA), we observe a resurgence of AP ancestry (up to ~50% ancestry fraction), as well as influence of West Eurasian Steppe ANE ancestry represented by the early BA individuals from Afanasievo in the Altai region (~10%) This is consistent with previous reports of gene flow from an unknown ANE-related source into Lake Baikal hunter-gatherers. 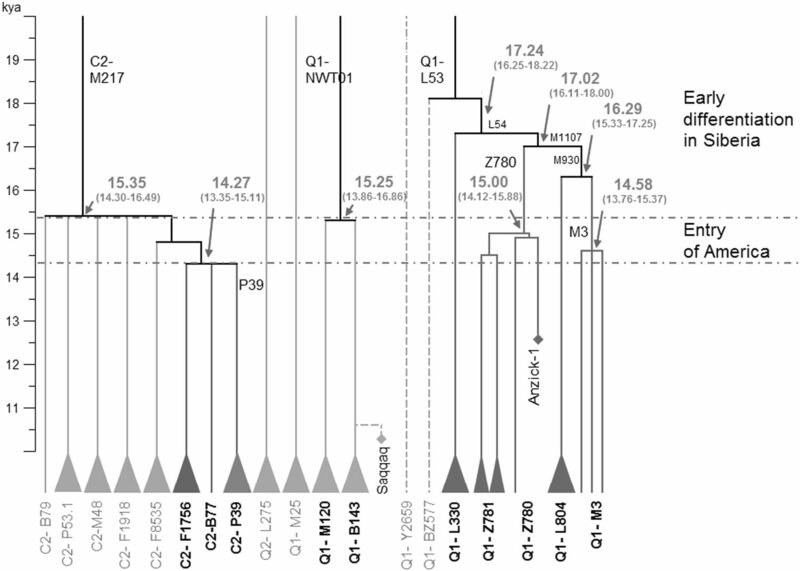 Our results suggest a southward expansion of AP as a possible source, which is also consistent with the replacement of Y chromosome lineages observed at Lake Baikal, from predominantly haplogroup N in the Neolithic to haplogroup Q in the BA. Finally, the most recent individual from Ust’Belaya, dated to ~600 years ago, falls along the Neosiberian cline, similar to the ~760 year-old ‘Young Yana’ individual from northeastern Siberia, demonstrating the widespread distribution of Neosiberian ancestry in the most recent epoch. At the western edge of northern Eurasia, genetic and strontium isotope data from ancient individuals at the Levänluhta site documents the presence of Saami ancestry in Southern Finland in the Late Holocene 1.5 kya. This ancestry component is currently limited to the northern fringes of the region, mirroring the pattern observed for AP ancestry in northeastern Siberia. However, while the ancient Saami individuals harbour East Asian ancestry, we find that this is better modelled by DGC rather than AP, suggesting that AP influence was likely restricted to the eastern side of the Urals. Comparison of ancient Finns and Saami with their present-day counterparts reveals additional gene flow over the past 1.6 kya, with evidence for West Eurasian admixture into modern Saami. The ancient Finn from Levänluhta shows lower Siberian ancestry than modern Finns . EDIT (27 OCT 2018): By comparing the three, I see these are samples published already (at least two) in Lamnidis et al. (2018), but here with added (1) specific radiocarbon dates, (2) comparison with Neosiberian populations and (3) strontium isotope analyses. Finnish_IA (ca. 350 AD) is probably a Saami-speaking individual, just like the Saami_IA with newly reported radiocarbon dates from Levänluhta ca. 400-600 AD (since Fennic peoples were then likely around the Gulf of Finland). The coast of the Bothnian Sea (=the northern part of the Baltic Sea, between Sweden and Finland) lay only 25-30 km to the northwest, and accessible to the Iron Age people of the Levänluhta region via the Kyrönjoki river. (…) For individual JA2065/DA236, the low 87Sr/86Sr value (0.71078) would imply an exceptionally heavy reliance on Baltic Sea resources. The δ13C and δ15N values of the individual are near comparable (especially considering within-Baltic latitudinal gradients in δ13C; Torniainen et al. 2017) to the δ13C and δ15N values of a Middle Neolithic population on the Baltic island of Gotland (Eriksson, 2004) interpreted to have subsisted primarily on seals. 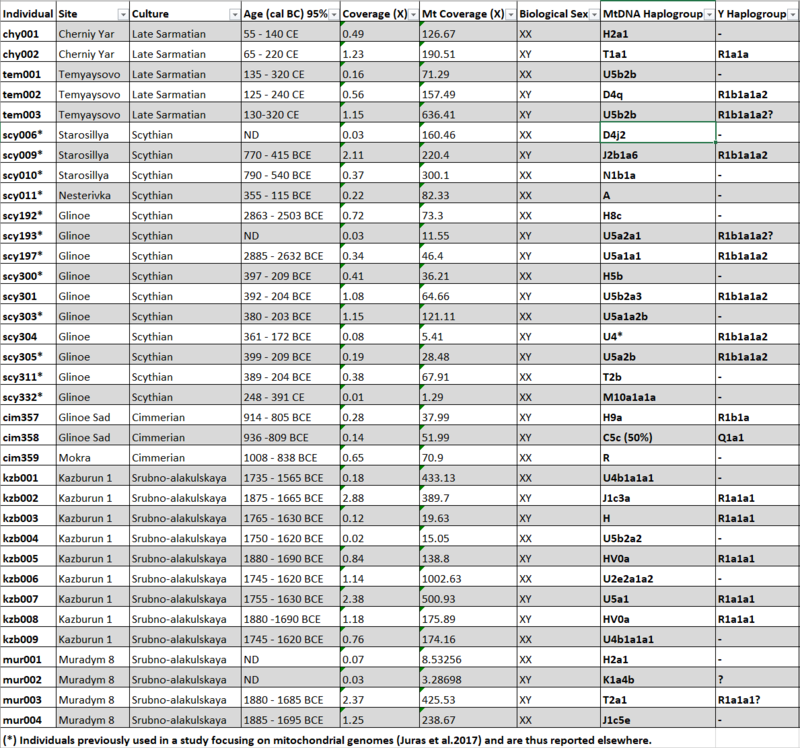 These new data on the samples give us some more information than what we already had, because the early date of Finnish_IA implies that there was few East Asian admixture (if any at all) in west Finland during the Roman Iron Age, which pushes still farther forward in time the expected appearance of Siberian ancestry among Saamic (first) and Fennic populations (later). It is unclear whether this East Asian ancestry found in Finnish_IA is actually related to DGC, or it is rather related to the ENA-like ancestry found already in Baltic hunter-gatherers (i.e. in some EHG samples from Karelia), for which Baikal_EN is a good proxy in Lazaridis et al. (2018). Since Bronze Age and Iron Age samples from Estonia show more Baltic_HG drift compared to Corded Ware samples, it is likely that this supposedly DGC-related ancestry (here considered part of the ‘Siberian ancestry’) is actually an EHG-related ENA component of north-east European hunter-gatherers, with whom Finno-Saamic peoples admixed during the expansion of the Corded Ware culture into Finland. The paper finds thus increased (probably the actual) Siberian ancestry in modern Finns compared to this Iron Age Saami individual. Coupled with the later Saami Iron Age samples, from between one to three centuries later – showing the start of Siberian ancestry influx – , we can begin to establish when the expansion of Siberian ancestry happened in central Finland, and thus quite likely when the Saami began to expand to the north and east and admix with Palaeo-Laplandic peoples. Admixture modelling using qpAdm. 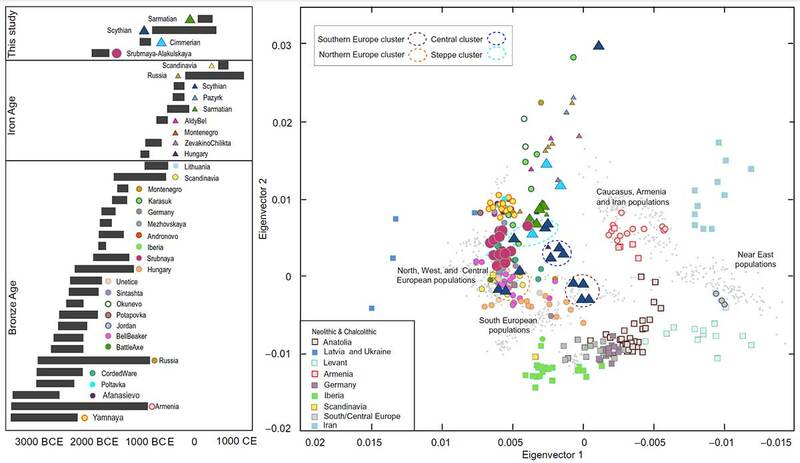 Maps showing locations and ancestry proportions of ancient (left) and modern (right) groups. The Proto-Saami language evolved in southern Finland and Karelia in the Early Iron Age, an area now host to Finnish and the closely related Karelian, but with Saami toponyms showing that the latter two languages are intrusive here (Saarikivi 2004). Saami-speaking populations are thought to have retreated to Lapland during the Middle Iron Age (300–800 AD), where it diverged into the modern Saami dialects. Genetically, the northward retreat of the Saami language correlates with the documented decrease of Saami ancestry in Southern Finland between the Iron Age and the modern period (cf. Lamnidis et al. 2018). On the way to Lapland, the Saami replaced at least two linguistically obscure groups. This can be inferred from 1) an influx of non-Uralic loanwords into Proto-Saami in the Finnish Lakeland area, and 2) an influx of non-Uralic, non-Germanic words into Saami dialects in Lapland (Aikio 2012). Both of these borrowing events imply contact with non-Saami-speaking groups, e.g. non-Uralic-speaking hunter-gatherers that may have left a genetic and linguistic footprint on modern Saami populations. The linguistic prehistory of Finland thus does not allow for a straightforward interpretation of the genetic data. The detection of East Asian ancestry in the genetically Saami individual is indicative of a population movement from the east (cf. Lamnidis et al. 2018, Rootsi et al. 2007), one that given the affinities with the ~7.6 ky old individuals from the Devil’s Gate Cave may have been a western extension of the Neosiberian turnover. However, it remains unclear whether this gene flow should be associated with the arrival of Uralic speakers, thus providing further support for a Uralic homeland in Eastern Eurasia, or with an earlier immigration of pre-Uralic, so-called “Paleo-Lakelandic” groups. Also, still no trace of R1a in far East Asia (reported as M17 ca. 5300 BC near Lake Baikal by Moussa et al. 2016), so I still have doubts about my previous assessment that R1a split into M17 (and thus also M417) in Siberia, with those expanding hunter-gatherer pottery. Open access paper New genetic evidence of affinities and discontinuities between bronze age Siberian populations, by Hollard et al., Am J Phys Anthropol. (2018) 00:1–11. NOTE. This seems to be a peer-reviewed paper based on a more precise re-examination of the samples from Hollard’s PhD thesis, Peuplement du sud de la Sibérie et de l’Altaï à l’âge du Bronze : apport de la paléogénétique (2014). The Afanasievo culture is the earliest known archaeological culture of southern Siberia, occupying the Minusinsk-Altai region during the Eneolithic era 3600/3300 BC to 2500 BC (Svyatko et al., 2009; Vadetskaya et al., 2014). Archeological data showed that the Afanasievo culture had strong affinities with the Yamnaya and pre-Yamnaya Eneolithic cultures in the West (Grushin et al., 2009). This suggests a Yamnaya migration into western Altai and into Afanasievo. Note that, in most current publications, “the Yamnaya culture” combines the so-called “classical Yamnaya culture” of the Early Bronze Age and archeological sites of the preceding Repin culture in the middle reaches of the Don and Volga rivers. 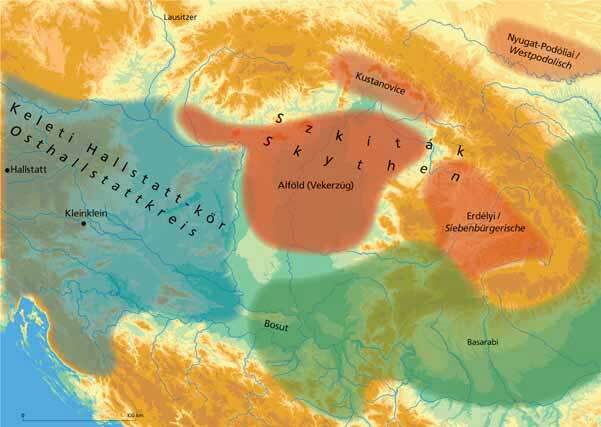 In the present article we conventionally use the term Yamnaya in the same sense, in which case the beginning of the “Yamnaya culture” can be dated after the middle of the 4th millennium BC, when the Afanasievo culture appeared in the Altai. Early Chalcolithic migrations ca. 3300-2600 BC. (…) our results therefore support the hypothesis of a genetic link between Afanasievo and Yamnaya. This also suggests that R1b was indeed dominant in the early Bronze Age Siberian steppe, at least in individuals that were buried in kurgans (possibly an elite part of the population). 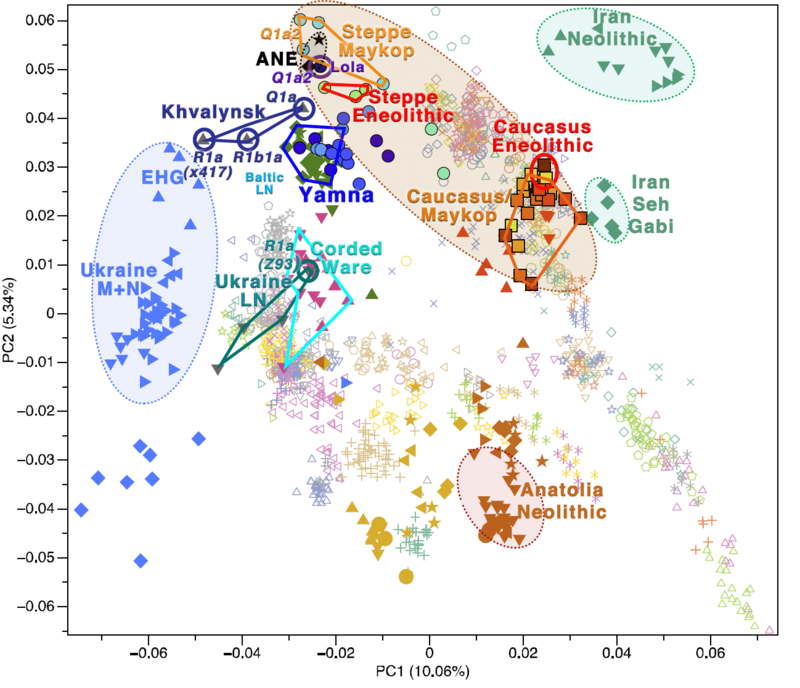 The geographical and temporal distribution of subhaplogroup R1b1a1a supports the hypothesis of population expansion from West to East in the Eurasian steppe during this period. It should however be noted that the Yamnaya burials from which the samples for DNA analysis were obtained (Allentoft et al., 2015; Haak et al., 2015; Mathieson et al., 2015) were dated within the limits of the Afanasievo period. Ancestors of both East Yamnaya and Afanasievo populations must therefore be sought in the context of earlier Eneolithic cultures in Eastern Europe. Sufficient Y-chromosomal data from such Eneolithic populations is, unfortunately, not yet available. Results obtained in the current study, from more than a dozen Okunevo individuals belonging to the earliest stage of Okunevo culture, that is the Uibat period (2500–2200 BC) (Lazaretov, 1997), suggest a discontinuity in the genetic pool between Afanasievo and Okunevo cultures. Although Y-chromosomal data obtained for bearers of the Okunevo culture showed that one individual carried haplogroup R1b, most Okunevo Y-haplogroups are representative of an Asian component represented by paternal lineages Q and NO1. Okunevo carrier of Y-haplogroup Q1b1a-L54, which also supports this hypothesis (L54 being a marker of the lineage from which M3, the main Ameridian lineage, arose). 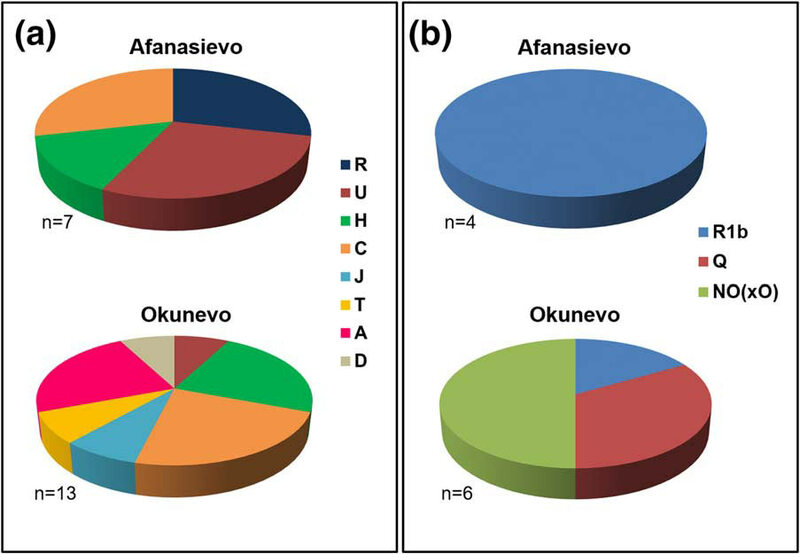 Okunevo people could therefore be a remnant paleo-Siberian population with possible Afanasievo input, as suggested by the presence of the R1b1a1a2a subhaplogroup in one individual. Late Chalcolithic migrations ca. 2600-2250 BC. 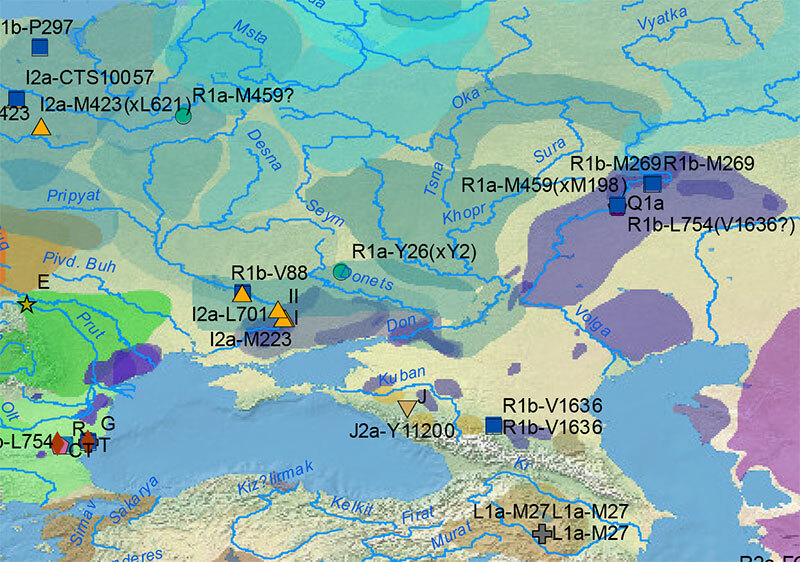 Published genetic data from the late Bronze Age Andronovo culture from the Minusinsk Basin (Keyser et al., 2009), the Sintashta culture from Russia (Allentoft et al., 2015) and the Srubnaya culture from the region of Samara (Mathieson et al., 2015), show that males did not belong to Y-haplogroup R1b but mostly to R1a clades: there appears to have been a change in the dominant Y-chromosomal haplogroup between the early and the late Bronze Age in these regions. Moreover, as described in Allentoft et al. 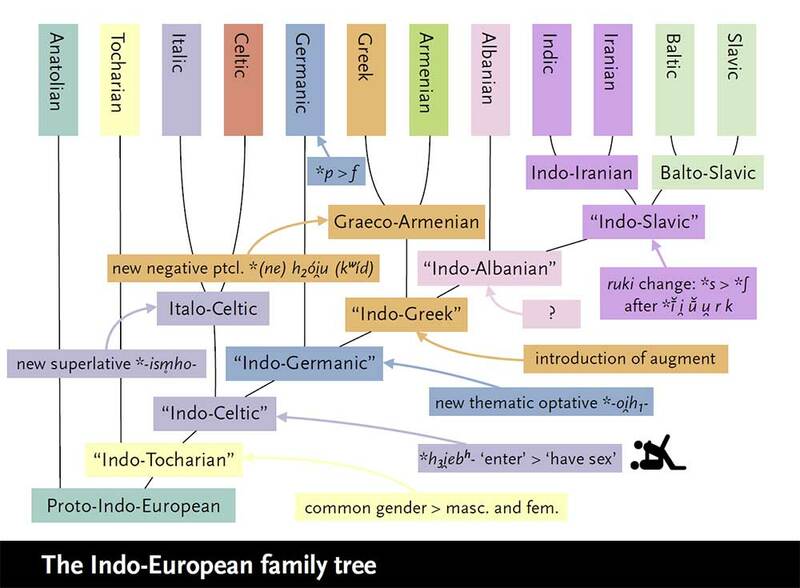 (2015), the Andronovo and Sintashta peoples were closely related to each other but clearly distinct from both Yamnaya and Afanasievo. Although these results do not imply that Y-haplogroup R1b was entirely absent in these later populations, they could correspond to a replacement of the elite between these two main periods and therefore a difference in the haplogroups of the men that were preferentially buried. Early Bronze Age migrations ca. 2250-1750 BC. The discovery, in the Tarim Basin, of well-preserved mummies from the Bronze Age allows for the construction of two hypotheses regarding the peopling of the Xinjiang province at this period. The “steppe hypothesis,” argues for a link with nomadic steppe herders (Hemphill and Mallory, 2004), possibly represented in this case by Afanasievo populations and their descendants (Mallory and Mair, 2000). However, newly published cultural data from the burial grounds of Gumugou (Wang, 2014) and Xiaohe (Xinjiang, 2003, 2007) shows material culture and burial rites incompatible with the Afanasievo culture. The earliest 14C date for Tarim Basin burials would place them at the turn of the 2nd millenium BC (Wang, 2013), 500 years after the Afanasievo period. Instead, early Gumugou and Xiaohe burial grounds were contemporary with the start of the Andronovo period. Likewise, the Bronze Age population of the Xinjiang at Gumugou/Qäwrighul is not phenotypically closest to Afanasievo but to the Andronovo (Fedorovo) group of northeastern Kazakhstan and western Altai (Kozintsev, 2009). Our investigations demonstrate that Y-chromosomal lineage composition is also compatible with the notion that the ancient Tarim population was genetically distinct from the Afanasievo population. The only Y-haplogroup found by Li et al. 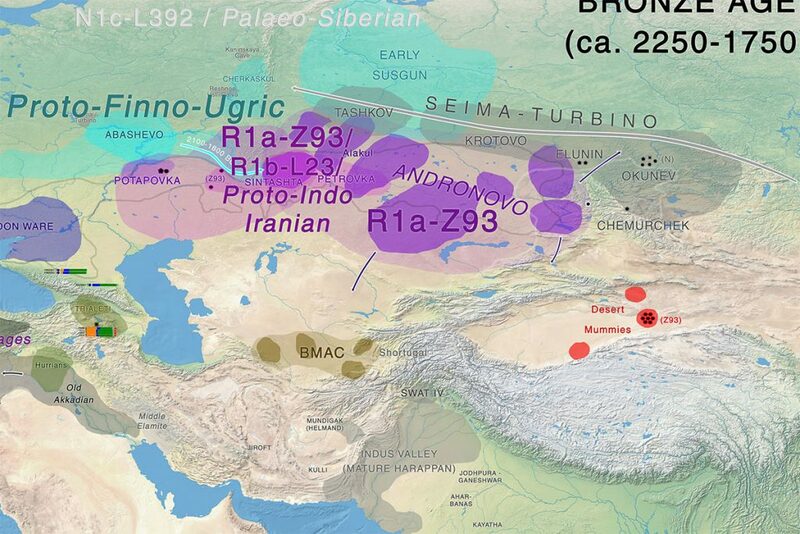 (2010) in the Bronze Age Tarim Basin population was Y-haplogroup R1a, which suggests a proximity of this population with Andronovo groups rather than Afanasievo groups. I would add that, once again, we have more proof that the movement of Okunevo and related ancient Siberian migrants from Central or North Asia will not be able to explain the presence of Uralic languages spread over North-East Europe and Scandinavia already during the Bronze Age. Also interesting is to read in more peer-reviewed papers the idea of Late Indo-European speakers clearly linked to the expansion of patrilineally-related elite males marked by haplogroup R1b-L23, most likely since Eneolithic Khvalynsk/Repin cultures. Open Access article on modern populations (including ancient samples), Between Lake Baikal and the Baltic Sea: genomic history of the gateway to Europe, by Triska et al., BMC Genetics 18(Suppl 1):110, 2017. The history of human populations occupying the plains and mountain ridges separating Europe from Asia has been eventful, as these natural obstacles were crossed westward by multiple waves of Turkic and Uralic-speaking migrants as well as eastward by Europeans. Unfortunately, the material records of history of this region are not dense enough to reconstruct details of population history. These considerations stimulate growing interest to obtain a genetic picture of the demographic history of migrations and admixture in Northern Eurasia. We genotyped and analyzed 1076 individuals from 30 populations with geographical coverage spanning from Baltic Sea to Baikal Lake. Our dense sampling allowed us to describe in detail the population structure, provide insight into genomic history of numerous European and Asian populations, and significantly increase quantity of genetic data available for modern populations in region of North Eurasia. Our study doubles the amount of genome-wide profiles available for this region. We detected unusually high amount of shared identical-by-descent (IBD) genomic segments between several Siberian populations, such as Khanty and Ket, providing evidence of genetic relatedness across vast geographic distances and between speakers of different language families. Additionally, we observed excessive IBD sharing between Khanty and Bashkir, a group of Turkic speakers from Southern Urals region. While adding some weight to the “Finno-Ugric” origin of Bashkir, our studies highlighted that the Bashkir genepool lacks the main “core”, being a multi-layered amalgamation of Turkic, Ugric, Finnish and Indo-European contributions, which points at intricacy of genetic interface between Turkic and Uralic populations. 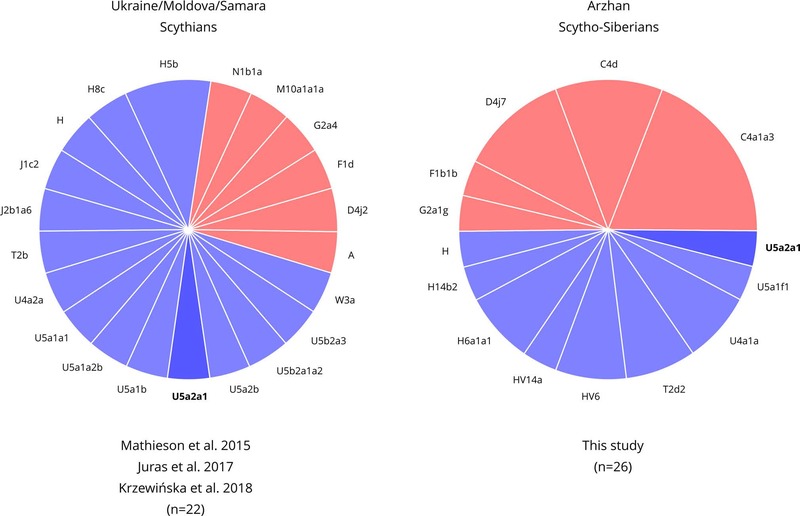 Comparison of the genetic structure of Siberian ethnicities and the geography of the region they inhabit point at existence of the “Great Siberian Vortex” directing genetic exchanges in populations across the Siberian part of Asia. Slavic speakers of Eastern Europe are, in general, very similar in their genetic composition. Ukrainians, Belarusians and Russians have almost identical proportions of Caucasus and Northern European components and have virtually no Asian influence. We capitalized on wide geographic span of our sampling to address intriguing question about the place of origin of Russian Starovers, an enigmatic Eastern Orthodox Old Believers religious group relocated to Siberia in seventeenth century. A comparative reAdmix analysis, complemented by IBD sharing, placed their roots in the region of the Northern European Plain, occupied by North Russians and Finno-Ugric Komi and Karelian people. Russians from Novosibirsk and Russian Starover exhibit ancestral proportions close to that of European Eastern Slavs, however, they also include between five to 10 % of Central Siberian ancestry, not present at this level in their European counterparts. Our project has patched the hole in the genetic map of Eurasia: we demonstrated complexity of genetic structure of Northern Eurasians, existence of East-West and North-South genetic gradients, and assessed different inputs of ancient populations into modern populations.